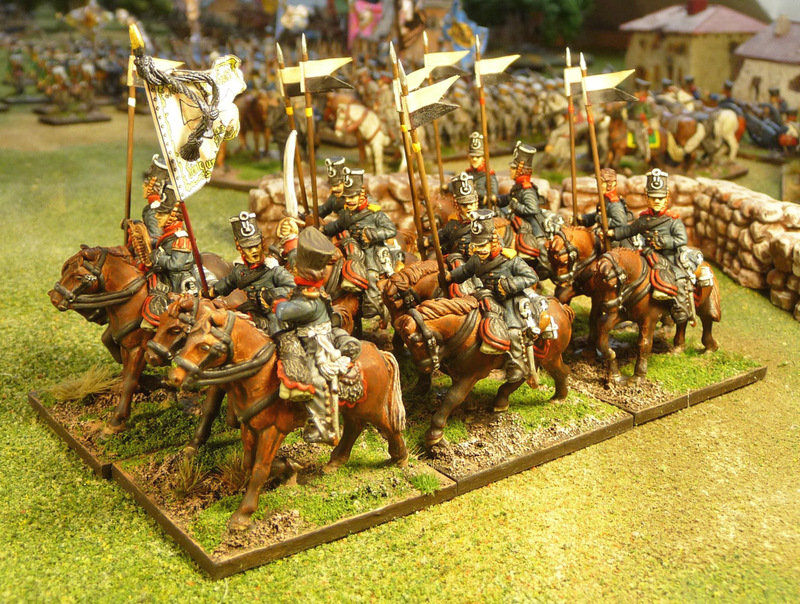 Next up is 2 units of Prussian cavalry. 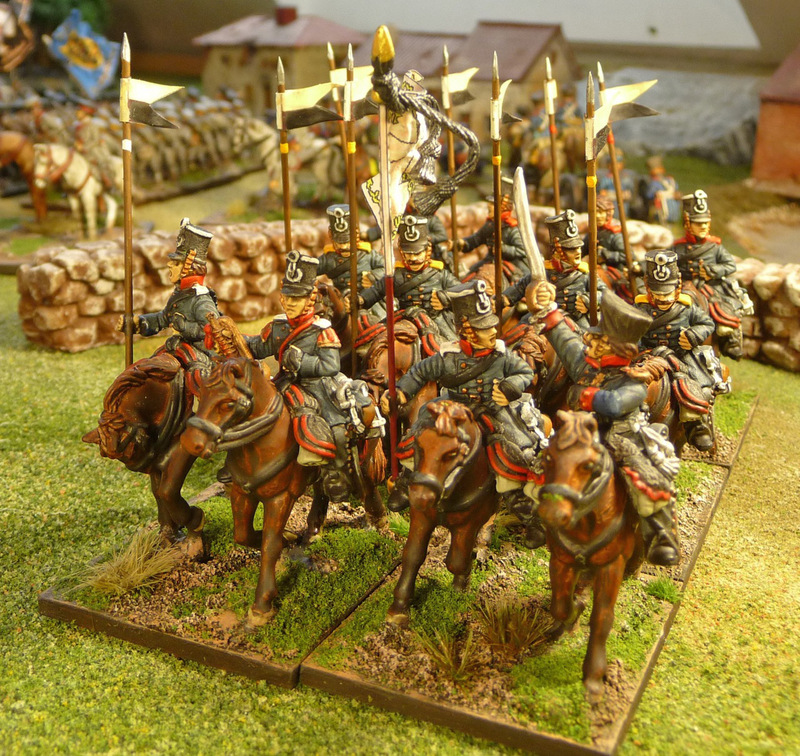 These are Calpe figures, and really they are the nicest figures I have painted to date. 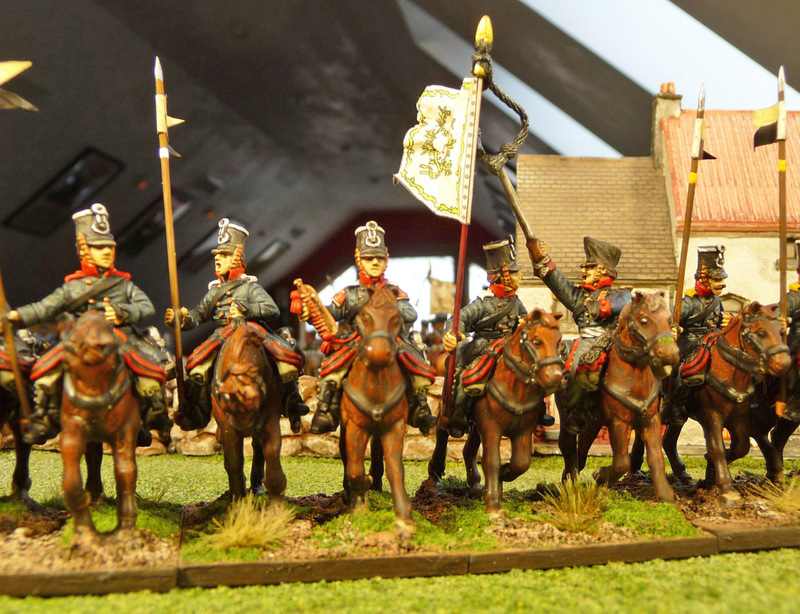 I may try some Perry Prussian cavalry as well, but these figures are first class, and it would have to think about it before I tried another manufacturer. 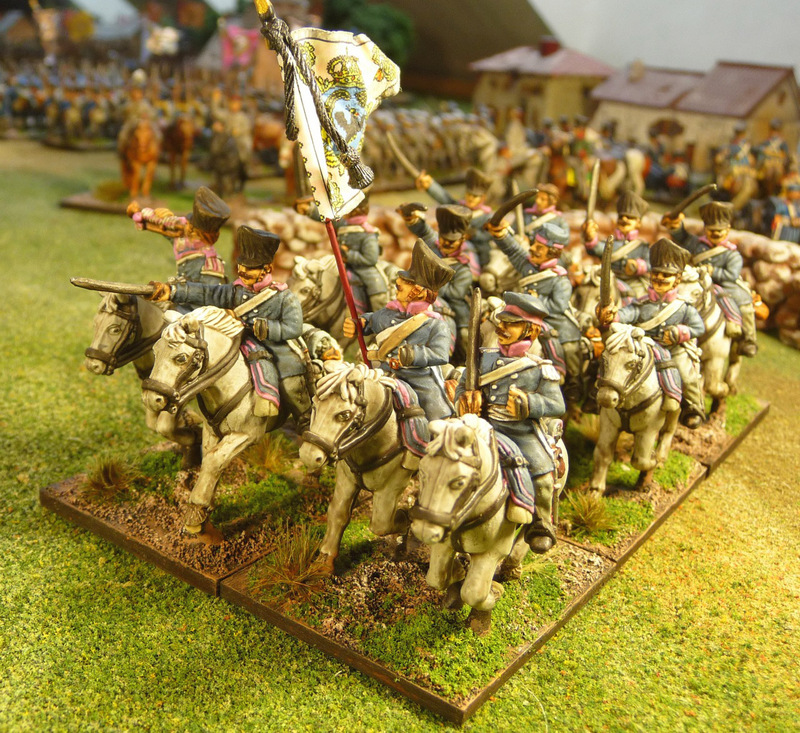 These figures were painted as my main entry into the La Bricole les pinceaux de la guerre painting contest. I am quite happy with how they came out. 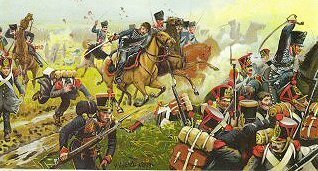 They are quite varied figures, with some bareheaded, some capped and most with the classic covered shako. Most of the figures are wearing the Litewka, but the squadron leaders are wearing the liebrock. The officers also have trousers rather then leather reinforced-overalls. They are marked by a red pin strip. The only real challenge was the eyes on the horses, which I usually paint white first and then almost completely fill in with black aside from the superior-temporal part of the globe. I just could not get it right on these horses. I may try again but, I am usually done with a figure when I am done! 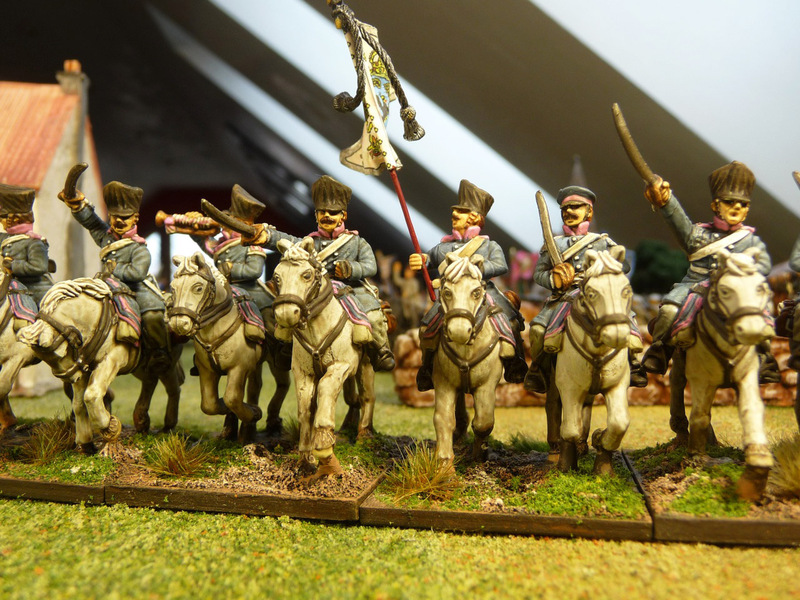 I have probably said this before, but of all the units I have painted to date, these are my favourite. I really like how they came out. The pennants are from GMB, and were repainted after application. The flag is from Flagdude. Each squadron has different coloured shoulder straps, if I add a fourth, it would be powder blue. I used airbushed Vallejo brown ink on the horses and I love how it worked. The variation in the horses coat is quite cool, and really the AP darktone added little in this case. I did vary from regulation in that the saddle cloth has been painted black, rather then dragoon blue. Just could not resist the red on black! This unit has an unusual shako, and that was my main reason for painting them, they are described here by Peter Fitzgerald. These are my second submission for the La Bricole competition and they also have been submitted to the Analogue Hobbies 2nd Winter Painting Challenge, alas of which I am well down the pack. Wow! The whole package looks really impressive. This is looking really good - inspiration to get the last of my Prussians done finally. 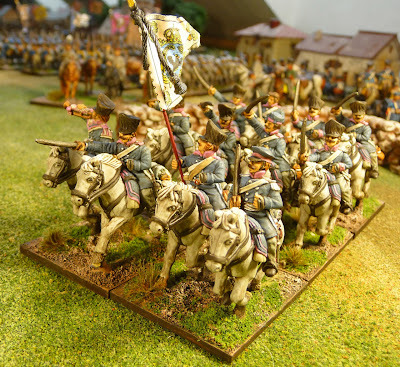 Lovely stuff John - your Prussian cav have really come up a treat. Good luck for the Bricole painting comp if you're in it! Looks like a winner to me! Missed this post! 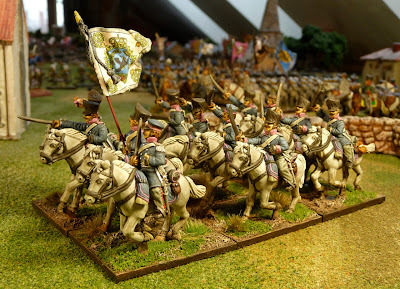 I love your Lanswehr Lanciers! 2 very cool regiments John!!! These are beautiful models. Really terrific. Excellent post. I've referenced it numerous times in getting my Landwehr off the painting table and now my dragoons. What should I do with these beautiful figures?